Sponsored by the American Museum of Natural History, the Central Asiatic Expeditions of the 1920s were led by Roy Chapman Andrews. In Mongolia in 1923 they found the remains of a new kind of dinosaur which they named Protoceratops andrewsi. 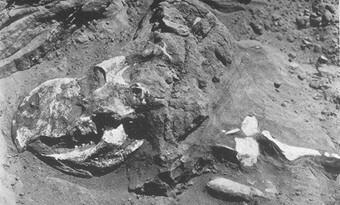 Photograph of a Protoceratops skull found in situ 1923. Perhaps the most remarkable find of the expedition was the discovery of dinosaur nests containing fossilised eggs - the first evidence that dinosaurs did indeed lay eggs. The eggs were found associated with over 70 specimens of Protoceratops and it was thus assumed that this creature laid them. In 1995 discoveries of Oviraptor embryos within the eggs proved that the eggs in fact belong to Oviraptor philoceratops ("the egg stealer with a love of ceratops eggs") - another dinosaur discovered on the same expedition and which for 50 years has been accused of stealing the eggs rather than laying them.